For long, the line “football is big business” was for many Nigerian football followers, limited to the fat wages, transfer fees that run like telephone numbers and eye-popping endorsements and television rights deals they gather around newspaper vendor stands to read about. Today, many of them are coming to believe and act upon this saying to add some extra cash to their pockets by doing something they’ve for so long done for fun, predict the outcome of football matches. Admittedly, there’s always been some kind of roadside sports pool staking in major cities of the country which has thrived for many decades but the recent explosion of full-fledged sports betting in the country has taken it to a whole new level. Powered by the increased adoption and penetration of the internet and e-commerce, sports betting now offer something extra such as online betting, live streaming, in-play betting, and reliable picks, and they are becoming a common feature on our streets. 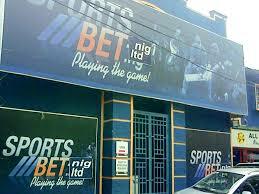 Indeed, there are many streets in Lagos today where the newest looking shop, often with an exaggerated external signage complete with neon lights, is a sports betting center. A recent report claimed there are as much as six betting companies within a 10-kilometre radius in the outskirt of the federal capital territory. And one has since lost count of the brand names of these outlets. They just keep sprouting all over the place. The bigger brands have become sought-after franchises, with agents, franchise owners if you like, that have contributed to the seeming ubiquity of the centers. If we kept proper statistics of new businesses in these parts, sports betting must top the list. This is not unconnected to the fact that it is really a big money spinner. 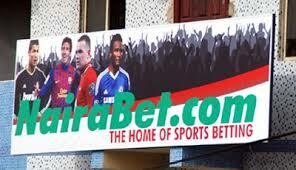 An August 2014 report based on investigations by the News Agency of Nigeria (NAN) suggested that about 60 million Nigerians between the ages of 18 and 40 years spend up to N1.8 billion on sports betting daily. 1.8 billion! And by one account in the report, a betting company can generate up to 20 million naira monthly and use between N5 million and N7 million to meet winners obligations in terms of payment. With just N100, sometimes even as low as N50, hundreds of people, old and young, male and female, emerge from the betting centers daily and twice the number on weekends, clutching slim papers containing their predictions, amounts staked and, hope. It is this hope and the promise of big jackpot that it holds that wins for the practice new converts daily. In a country where poverty levels are so high and unemployment is in double digits, this is not surprising at all. This hope also breeds addiction, which is a problem of its own. The damaging effects of gambling on an individual and society are well documented and it is not different in this case. The lure for easy money and the investing of everything into getting it, including loans, could lead to catastrophic ends when the expectations are not met. This becomes even a bigger issue when the player is not properly protected by law as is the case here. What is more? Even though some betting companies claim on their websites that only those aged 18 and above are allowed to bet, in reality, underage players are increasingly getting hooked to the practice because there is no gatekeeper. The implication of this is huge. For starters, that such a relatively new law is so inadequate tells the story of how thorough our lawmakers are. That it has taken us this long to get it amended says just how serious we are as a people. But we hope still that soon it will be amended and when it comes through – If and when our recess loving lawmakers finally get around to it — the lottery regulatory commission will become able to issue permits with specified terms and conditions for sports betting operators. This hopefully should help in defining standards, weeding out the pretenders, protecting the interest of the players and ensuring transparency and accountability in the lottery business in Nigeria. Until then, the betting companies can continue to smile to the bank while the players continue to take their chances… betting on hope.